The Baisha Ancient Village is one of the oldest towns in Lijiang City. It got its name “Baisha” meaning “white sand” from the natural white sand in the area. It was the cradle-land of the Tusi Dynasty evolved from the Mu Clan. Address: about 10 kilometers north of Lijiang Old Town, borders Jade Dragon Snow Mountain to the north, Dragon Spring to the south, Zhi Mountain to the west. 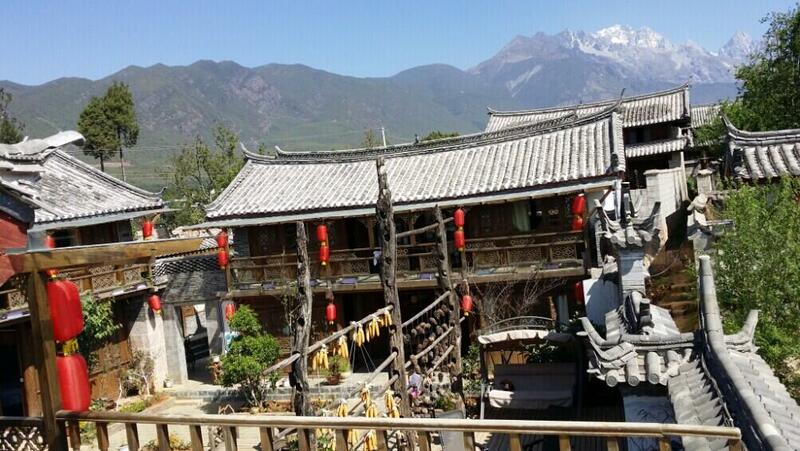 The Baisha Ancient Village is one of the oldest towns in Lijiang City. It got its name “Baisha” meaning “white sand” from the natural white sand in the area. It was the cradle-land of the Tusi Dynasty evolved from the Mu Clan. It was also the earliest settlement of the Naxi people. There are many ancient constructions built in the Ming Dynasty: the Dabaoji Palace, the Liuli Temple and the Wenchang Palace. The well-known Baisha Frescoes are situated in the Dabaoji Palace. The architectural complex is made of two parts, the folk residence and the cultural sites. The folk residence is called “Peng Shi Zhi” in local language meaning the “White Sand Streets”. All the streets were constructed oriented from north to south. In town center, there is a square at where three avenues intersect. Houses and small stores line up on both sides of the streets. A crystal-clear brook flows around all houses passing the small town from north to south. As mentioned the Baisha Ancient Town was the cradle of Mu clan. The Mu family was famous for their city planning skills and experience. 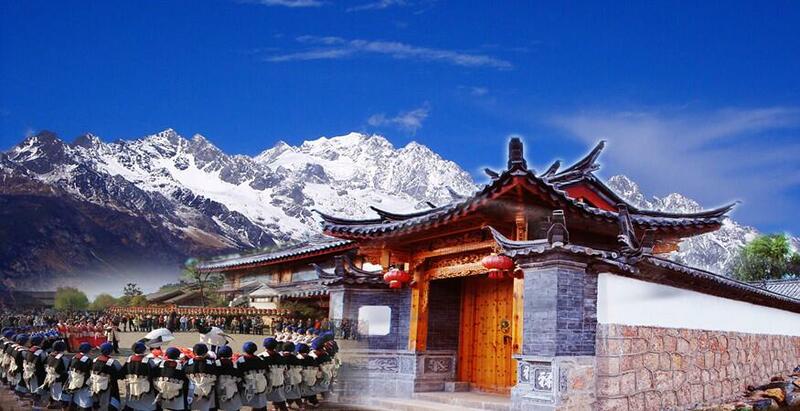 Early in the Tang Dynasty, once the emperor of the Nanzhao State named the Yulong Snow Mountain “North-Yue”, the ancestors of Mu clan began to construct Baisha Streets and North-Yue Temple in Baisha Ancient Town. These constructions had witnessed the golden age of the Baisha Ancient Town. In the Song Dynasty this town prospered further and became the economic, political and cultural center of the Lijiang City. Later in the Ming Dynasty and Qing Dynasty the Mu family migrated to the Dayan town gradually. The central district of the town is characterized by clusters of temples called “Mudu” and a huge square symbolizing the political power and influence of Mu family at the time. Among the remaining ancient architectures, the Fuguo Temple, the Dabaoji Palace, the Liuli Palace and the Dading Pavilion were built during the reign of Tusi offspring of the Mu clan. In the meantime, the Mu people began to channel water from the Yulong Snow Mountain into the town for irrigation and water supply which could be the one of the earliest irrigation engineering works. At the end of Baisha Old Street, there is a huge cluster of temples built in the Yongle Period of the Ming Dynasty. It consists of three yards: the Sutra Collection Pavilion that is the dooryard, the Liuli Temple that is the cloister and the Dabaoji Palace that is the backyard. The palace occupies an area of about 73 square meters. Among the 28 fresco groups in the palace, the painting about the Sakyamuni explaining the sutra passages to his disciples is the most famous and valuable one. These mural paintings of more than 100 statues and tales, with their fine line, smooth carvings, rich colors, vivid pattern and harmonious composition amazingly lively presented religious tales and activities of Taoism, Buddhism and Tibetan Buddhism. They are valuable treasures of Chinese painting history and cultural heritage. The frescos were created by Han artists in collaboration with Tibetan artists; they thoroughly demonstrated superb artistic skills and creativity. The Dading Pavilion, about 10 meters away from the Dabaoji Palace, is dated back to the Wanli period of the Ming Dynasty (1572 AD). The 16 well-preserved mural paintings in the Dading Pavilion were created in the Qing Dynasty. Compared to those in the Dabaoji Palace, these paintings have beautiful shapes, bright color and precise lines creating strong visual impacts and sensation. It is also valuable national treasure and cultural inheritance. The 44 pieces of Baisha frescos were carved in the early Ming Dynasty. Most of the paintings depict religious stories of Taoism, Buddhism and Tibetan Buddhism. The mural embodies the artistic characteristics of Naxi, Tibetan, Han and Bai ethnic groups. Among them the paintings of Kwan-yin and Sakyamuni are the most famous ones. Now Baisha Frescos, also known as Lijing Frescos have become precious data for studying history of Chinese arts and religions. By Taxi: you can take taxi in the downtown of Lijiang and the round ticket is about CNY 40. By Bus: you can take bus No.6 to Baisha Road and then walk into the old town. By Bike: about 12 kilometers from Lijiang Old Town to Baisha Old Town by bike. The best time to visit is from April to October because the scenery at that time is charming. During March to August, various flowers put forth their blossoms. In Spring time, travelers should pay attention to prevent fire and sunburn because of the windy and dry weather. In Summer, the temperature is high and rainy season comes. In Fall, the favorable temperature, colorful trees and flowers add more charm. In winter, The weather is sunny in the day time and cold at night.